So I was in the middle of putting together a little write up about a couple pieces of Star Trek music, when two notable events occurred here at tunequest. In progress news, I crossed the sub-1000 songs remaining threshold yesterday while listening to Joe Hisaishi’s score to Spirited Away. Hisaishi has composed music for nearly all of master Japanese director Hayao Miyazaki’s animated masterpieces. The beauty and grandeur of those films is matched, if not exceeded by, their music. Always melodious, mysterious, sweeping and haunting, it gives me chills. Meanwhile, aside from that milestone, tunequest was apparently accepted into the 9rules blogging network, whose stated mission is to advocate and promote top-shelf content and talent. I’ve only recently become familiar with it and, honestly, submitted my entry on a purely “what-the-hell” basis. So to be accepted is a freakin’ huge compliment. To which I simply say, “Aw shucks.” 🙂 and I look forward to contributing. The thing is, the actual tunequest was always going to be a time-limited endeavor. My goal was to listen to every song in my iTunes library before the end of the year. That’s it. It started as simply a personal journey to acquaint (and re-acquaint) myself with the myriad of tunes that I had collected, but had gone neglected since the advent of the iTunes+iPod paradigm. Early on, I decided to chronicle this quest, choosing to tell myself and others what all this music means to me. I figured that by this time of the year it would be neat to look back at all I had done and be like, “Yeah, that was cool” and just share some of my thoughts and experiences. 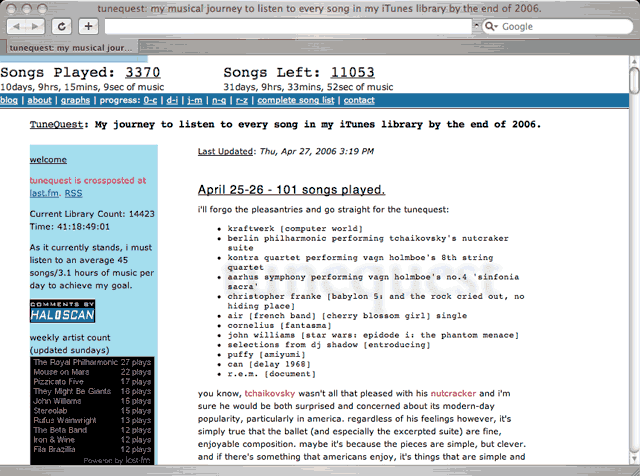 When I started this, I literally had thousands of songs that I’d never played or hadn’t listened to in years. Part of the goal was to really evaluate the music in my possession. Going in, I knew that the ease of digital distribution had led to my acquiring music simply because it was possible. The problem was that the pack rat in me wouldn’t let me get rid of things, particularly the obscure and under-rated things. (I’m a sucker for an underdog). And you know, under this evaluation, I discovered that most of my music was worth keeping. It turns out I had originally liked it for a reason. Sure, not everything aged well. My affinity for drum-n-bass has waned significantly and there were multiple film scores that I just never got into. Bjork’s Medulla, gone. Kid Koala, gone, as are a handful of “glitch/noise” records whose indie cred of being “difficult but rewarding” wasn’t enough to justify keeping them around. In total, only about 7% of my library has been cut. But the real surprises came when an album or artist defied my expectations. More often than I would have guessed, the albums that I had pegged as potentials for deletion were actually quite compelling. I was frankly astonished that Franz Waxman’s 1935 score for Bride of Frankenstein perfectly blends my love of both film and classical music. Nobukazu Takemura’s Child’s View and For Tomorrow re-affirmed that the man is a genius. Heck, even The Offspring, who I continue to like against my better judgement, managed to con me into keeping Conspiracy of One around. But that’s all past and this is supposed to be about the future. Even though the original tunequest will be drawing to a close soon, music will be around for a long time. Hopefully, I’ll be around a long time to listen to it. I’m sure I’ll have opinions, thoughts and an intensive desire to share. So, moving forward, I don’t expect much to change around here. Content will take a looser form I suspect, since it won’t be tied to the rigorous listening pattern of my library. And I’ll possibly branch out into other subjects from time to time. I am also toying with the idea of initiating “mini-tunequests,” that is, finding a particular niche of music and exploring it in detail, like all the James Bond scores or something similar. Format-wise, I plan to continue posting insights and observations about the music in my life, the song of the day though probably not every day and tips and ideas for getting the most out of iTunes and iPods. I’m also hoping to resurrect my long-defunct “Records that time forgot” series. But if this experience has taught me anything, it is that a tunequest is a life-long journey. Oh, and feed subscribers will continue to get curated links to free music downloads.